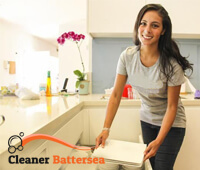 If you are to move out of your rented property, consider booking our end of tenancy cleaning service in Battersea. We will help you put your lodgings in order and get rid of all germs and grime. We have extensive experience in this industry and promise you satisfactory results. Our technicians are 100% professional. They have the required skills. Plus, they are quite dedicated to their occupation. It has to be said that we offer competitive prices and flexible appointment slots. It’s easy to make an appointment. We suggest you give us a call today. We will be waiting for you. There is no doubt that we offer reliable end of tenancy cleaning packages in SW11. Many people have resorted to our company throughout the years and we got great referrals from them. We tend to keep a reasonable standard of service at all times. We are confident we can satisfy your needs, even if you are too picky. If you want to know what distinguishes us from our competitors, keep reading. First off, we use a one of a kind cleaning system, which is very successful and over the years has proven to be quite effective when it comes to removal of stubborn stains, bacteria, grease and grime. It involves using a variety of cleaning methods that work wonders. We also use the latest cleaning equipment. We have different solutions for different cleaning problems and we know how to use them. What’s more, we are pleased to inform you that there is a 100% guarantee on our cleaning service. You will be given a re-clean for free in case you are not totally satisfied with the cleaning. Please, make sure to book our end of tenancy cleaning service in SW11. We can’t wait to hear from you. Contact us right away.